We were holding on with the tightest of grips. It slowly began to rain and the other jeeps started to put their canvas covers on. Our jeep refused. Either because we were all a bit mad or maybe it was because we were hoping the rain would just be a quick passing shower. Thankfully, it was the latter. 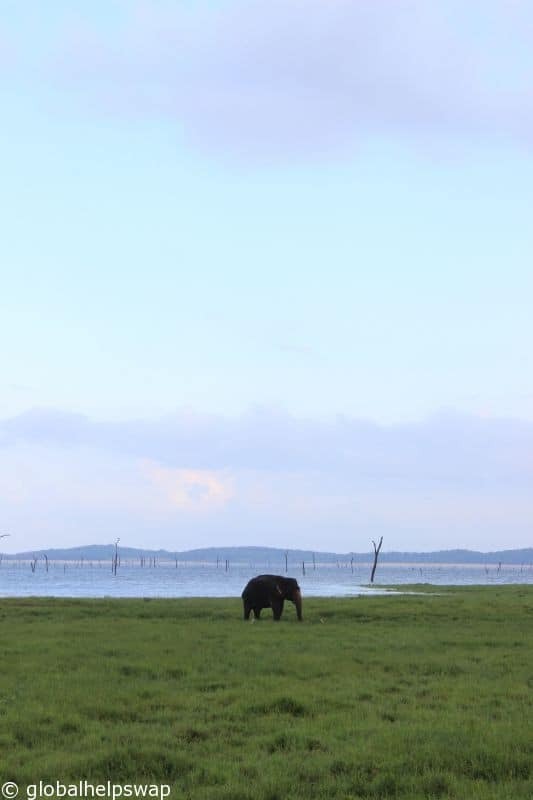 As we got closer to the edge of Kaudulla National Park, it dawned on me that this would be the first time I would see elephants in the wild. To say I was excited is an understatement. 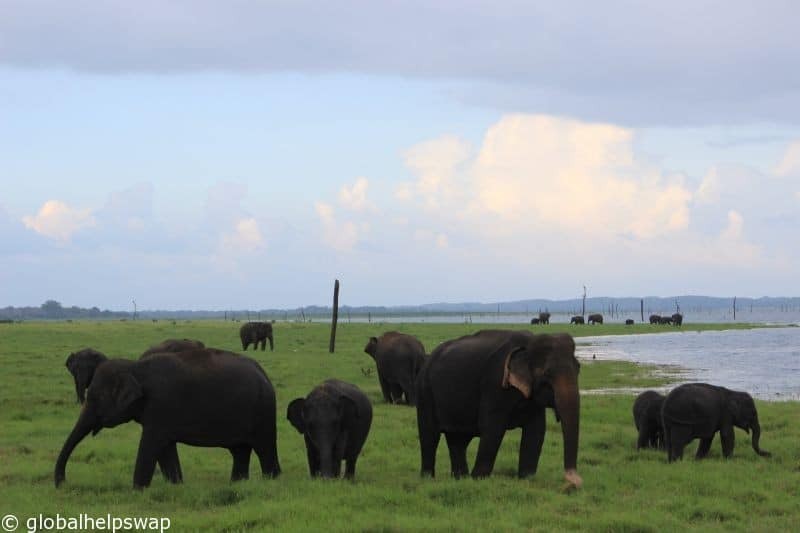 Kaudulla National Park is roughly 122 miles away from Colombo. It was declared a national park in 2002 and attracts tourists and locals for its wonderful wildlife. 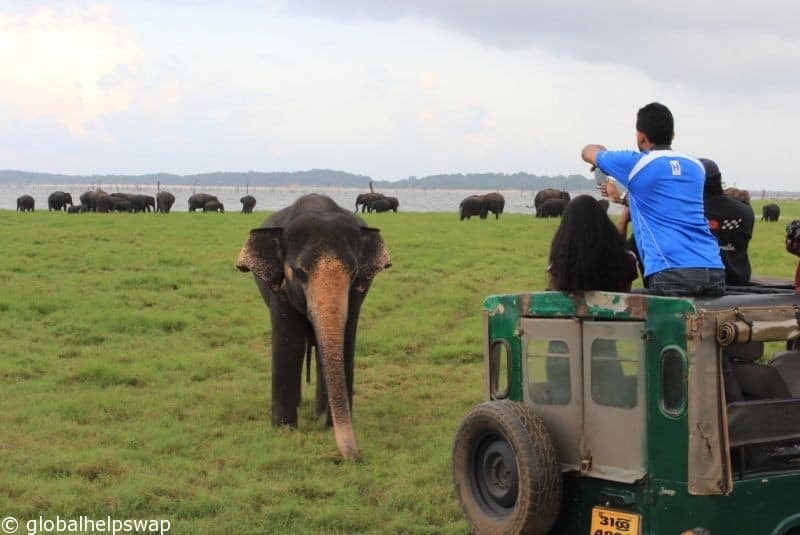 You can see Sambar Deer, Wild Boar, Sri Lankan Leopard, Sloth Bear and lots of types of exotic birds. But we were there for the big guys. I have been lucky enough to see Elephants in Thailand at the wonderful Elephant Nature Park but nothing compares to seeing Elephants (or any animal for that matter) in their natural habitat. 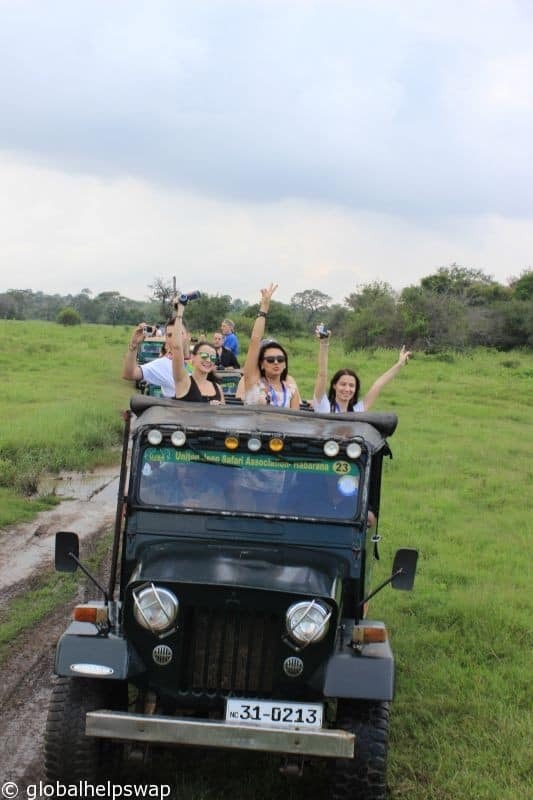 The safari was organised by Cinnamon Nature Trails a company I would highly recommend. Not only are they one of Sri Lanka’s leading eco companies they also have worked with the likes of National Geographic, BBC Natural History and The Discovery Channel. And now us! When we first entered the park there was no sign of the Elephants. They are wild after all so we weren’t guaranteed to see them. After 5 minutes though we spotted this guy above. We knew he was a male as he was on his own. There was an instant hush that passed over all the jeeps as we slowed down to observe him and take photos. It was mesmerising just watching him stand there. If he was the only wild elephant we saw, I would have been happy but he was just the beginning. We then met the rest of the family. I had many memorable moments during my time in Sri Lanka but this was the highlight. Being next to one of the largest animals on the planet in their natural habitat was an honour and a privilege. They nonchalantly kept eating as we edged closer to them, although the moms kept a protective barrier between us and their little ones. I could have spent all day just watching these beautiful creatures. The team could have just dropped me off under a tree and I would have been in my element. Why is it that when we are next to nature in all its majesty we get a sense of calm that envelops us? Maybe it’s some deep memory that resides in all of us of our distant past. I was with 40 other bloggers on this trip. These are some of the most travelled people on the planet and yet from each jeep you could hear cries of delight and whoops of joy. That’s what the natural world does. I believe no man-made activity can ever replace that feeling. This should be the only way we see elephants. Not in zoos, circuses or theme parks. Unfortunately, until we all use responsible tourism companies like Cinnamon Nature Trails, the bad practices will continue. We christened our favourite Elephant (the one above) Diva as she was always coming close to the jeeps to pose. Witnessing elephants in the wild is thrilling. By booking with a responsible tourism company not only do you get to help save these beautiful animals for now, you get to save them for future generations. 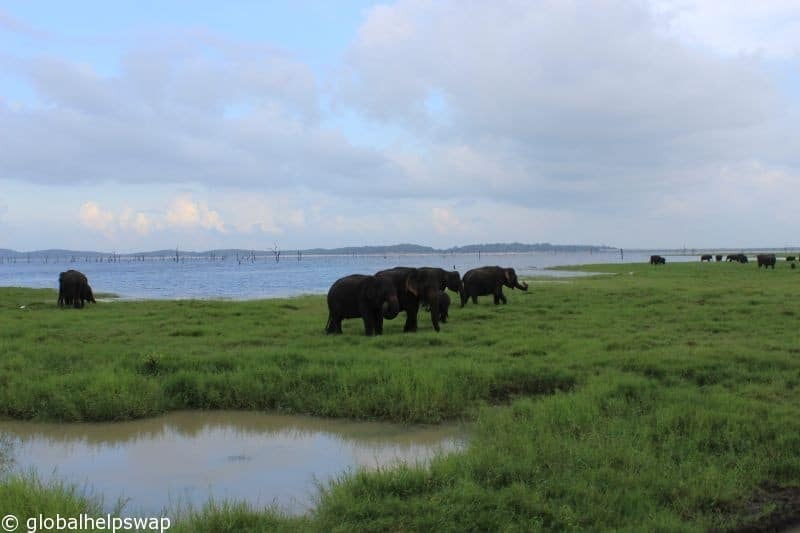 Since the Kaudulla National Park opened, elephant numbers have increased. 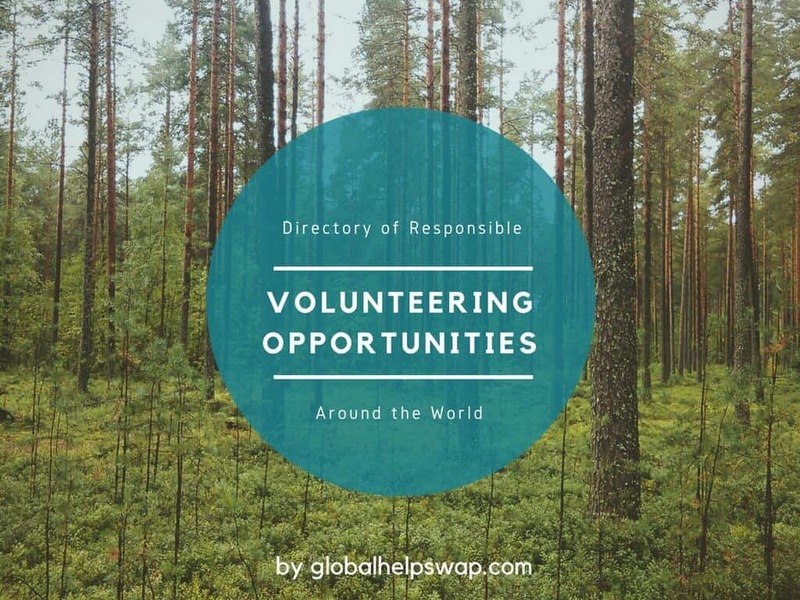 This is an area where you can make a difference when you travel. Sigiriya Rock Fortress Climb – Here is our blog on the Sigiriya Rock Fortress Climb, Sri Lanka. It started off fine but near the end, we had some unexpected visitors that were not happy. Sri Lanka Trekking – Sri Lanka is rightly known for its diverse wildlife, stunning beaches and its delicious spicy cuisine. Sri Lanka trekking should also be added to that list. Our Top 7 Unawatuna Restaurants – If you are heading to Unawatuna and want to know where to eat, then you definitely should read which place made our top 7 restaurants in Unawatuna. The Perfect Day In Galle – If you are planning a trip to Galle, Sri Lanka, watch our Perfect day in Galle video to get some inspiration. 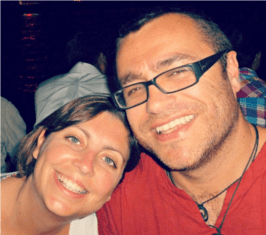 Things to do in Nuwara Eliya – Are you looking for things to do in Nuwara Eliya, Sri Lanka? Check out our list for some inspiration. From trekking to frog watching we cover them all. 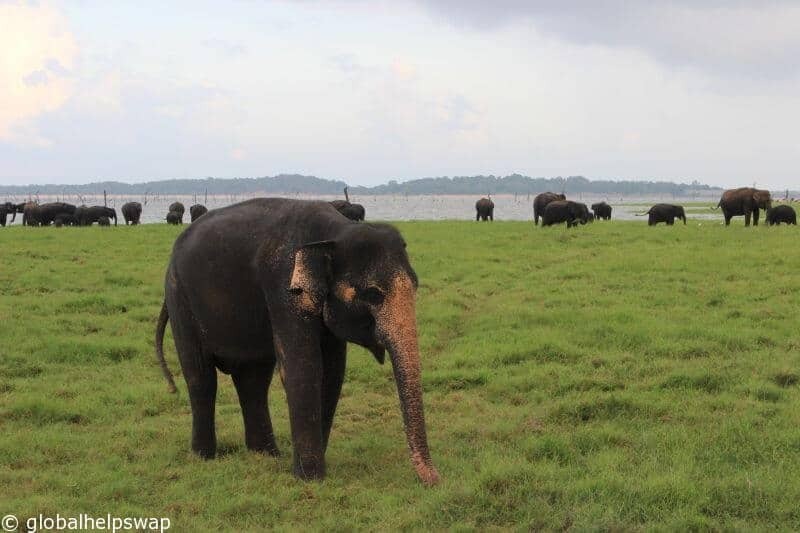 I would like to thank Cinnamon Hotels and Sri Lankan Airlines for inviting me on the Elephant Safari. As always, opinions are my own. Wonderful post. Love me some elephants! Thank you! I know, especially the baby ones. Too cute. Thanks Noel. I agree, Sri Lanka is one special place.